Benny's Bagels lives up to its name, serving up a wide assortment of bagels with a delicious range of fillings. Sweet, savoury and in-between, there's something for every taste. A complete range of beverages is also on offer at Benny's including coffees, smoothies and juices. One of the favourites at Benny's is a Lox bagel, with capers, onions and all the usual suspects. Most bagels cost around $6 - $7. Coffees and other drinks are also priced standardly. 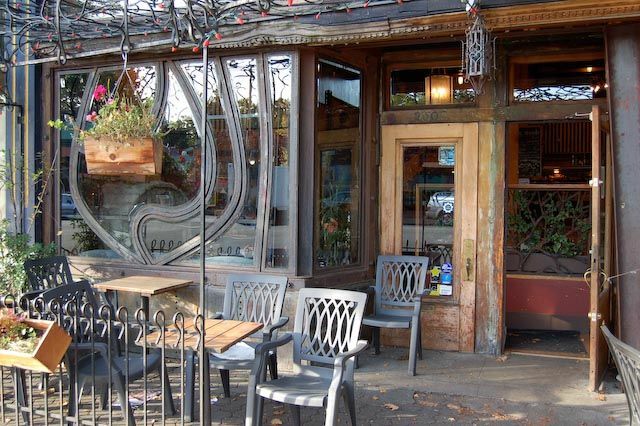 Located at Broadway and Larch in Kitsilano, Benny's has many tables inside and out, with some interesting windows finishings to break up the view of the traffic on Broadway for those sitting inside. One irk experienced by many visitors is that tables are often occupied by students on laptops, who may not move from their position for hours. But, if you feel comfortable sitting with someone else, pull up a pew beside them and relax. Placing a time restriction on internet usage would potentially alleviate this problem. While their bagels are certainly tasty, you may need to be prepared to wait. A seeming lack of staff at times means up to ten minutes for a bagel sandwich. Also because of this lack of staff, there is often dirty dishes scattered over many of the free tables - it's never a nice experience clearing your own table before dining. A quick snack is what Benny's does best (well, relatively quick). Don't go there for the ambiance or cleanliness. Benny's Bagels is at 2505 West Broadway. How many things can you cram into one sunny weekend? In spring we should be fitting in as many as we can, so here are some ideas on what to do with your sunny spring days.